Act Now-Women's March Minnesota-Join Women's March! We Need You. Join Women's March! We Need You. Women’s March MN - one of the largest women’s movements in the US and in Minnesota. Bring your passion to our all-volunteer team. We are stronger together, and we need you! Monday, August 13, 8-8:30 pm. Join 200+ other volunteers to make sure women’s voices are heard in MN. Use your leadership and organizational skills, passion, and power to make change! We need to use our political power – vote, speak, activate! What can happen when we work together – and what can we create in 2018 and beyond? Join one of our issue area committees; use your knowledge, relationship building skills, and project management experience to participate in a committee, write content for our newsletter and / or social media, host educational events, and empower your ACTIVISM! Our Unity Principles are the grassroots backbone of our work, and include the following: Rights for People with Disabilities, Immigrant and Refugee Rights, Workers’ Rights, Environmental Justice, LGBTQIA+ Rights, Ending Violence, Civil Rights, and Reproductive Justice. Is project management your thing? Are you able to see the big picture and break it down to all the pieces to get stuff done? Are you great at motivating teams of volunteers? Is coordinating and scheduling and getting all the I’s dotted and t’s crossed your superpower? WE.NEED.YOU! Join our Special Events Team! 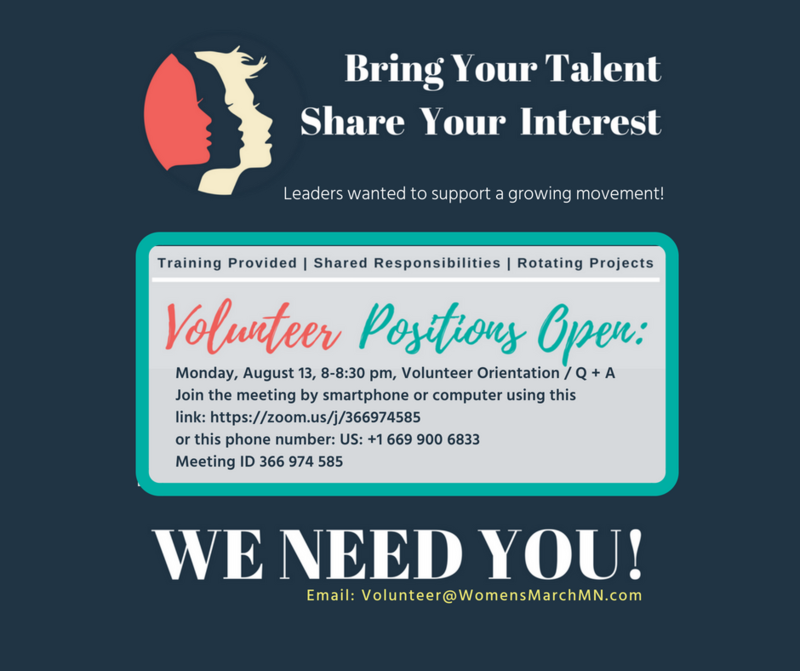 Interested in getting involved with Women's March MN? Email: volunteer@WomensMarchMN.com today! Primaries Next Week! Find out what’s on your ballot.